The Guardian/GuardianX 480 Volt Series indoor/outdoor Air Conditioners are designed specifically for NEMA 4 or 4X enclosure applications that require washdown or are subject to outdoor storm conditions. All Guardian models have a NEMA 4 Rating. The GuardianX, with a NEMA 4X Rating, is offered with a Stainless Steel Shell and Internal Corrosion Protection. 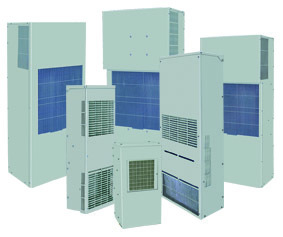 These Air Conditioners have been engineered to operate under the most demanding industrial applications. The components used in these models have been specially designed and tested to maintain cooling efficiency in temperature controlled enclosures in bottling plants, the automotive industry and other commercial/manufacturing applications. With Epoxy-coated coils and tubing, the closed-loop cooling system of the Guardian/GuardianX 480 Volt Series offers added security by providing an operating environment safe from harsh ambient conditions. The Guardian/GuardianX 480 Volt Series consists of units with heights from 24 to 60 inches, offering 3,000 to 26,000 BTU/H ratings. In addition to the list of standard features, these Guardian/GuardianX 480 Volt Series Air Conditioners are also available with a wide range of accessories and options, including compressor short cycle protector, temperature alarm and heater kit. The features engineered into the Guardian/GuardianX 480 Volt Series make them a tamper-resistant choice for external applications. With all models UL/CUL Listed, the Guardian Series is an excellent choice for telecommunications, wastewater treatment, food and beverage and other challenging applications. All Guardian Series models are UL/CUL Listed. Condenser and Evaporator Coils in the Guardian/GuardianX 480 Volt Series are Epoxy-Coated. This coating will withstand 1000 hours of salt spray per the ASTM B 117 test method. Also see Stainless Steel Shell, or Integrity NEMA 4/4X Air Conditioners. NOTE: Severe operational environments such as waste water treatment and salt spray are likely to cause corrosion failure over a period of time regardless of coating. Warranty: Corrosive conditions may affect the warranty coverage. Consult factory for warranty limitations in corrosive environments. NOTE: For additional corrosion protection options, contact factory. An air cured coating is sprayed on copper lines and brazed joints on the condenser side, providing a degree of protection from corrosive environments. This coating will withstand 1000 hours of salt spray per the ASTM B 117 test method. Also see Stainless Steel Cabinet or Integrity NEMA 4/4X Air Conditioners. NOTE: Severe operational environments such as waste water treatment and salt spray are likely to cause corrosion failure over a period of time regardless of coating. Warranty: Corrosive conditions may affect the warranty coverage. Consult factory for warranty limitations in corrosive environments. NOTE: For additional corrosion protection options, contact factory. NOTE: Internal Corrosion Protection is a Standard Feature on GuardianX Series NEMA 4X models. All GuardianX Series units are fully gasketed for tight, leakproof installation, in compliance with the NEMA Type 4X Enclosure Ratings. For applications in corrosive or other hostile environments such as those requiring Internal Corrosion Resistant Coatings, especially where chemical/moisture combinations are present. NOTE: Stainless Steel Shell is a Standard Feature on GuardianX Series NEMA 4X models. Either R410a, an HFC having zero ozone depleting potential, or CFC-Free R134a is used in Guardian Series Air Conditioners.